Some beautiful windows in magnificent homes deserve to be dressed in luxurious excellence. As in regal palaces and mansions throughout the world, stately windows of opulent quality are adorned in the most glorious of fabrics. The end result can easily dance upon the eyes as works of art, particularly when framing the glory of nature’s vistas. Your home is your castle, no?! Lavish curtains and drapes are a most wonderful compliment to enhance your decor, accentuate craftsmanship and architecture and perfectly frame windows with beautifying grace for optimal showing, both inside and outside of your home. Big feature windows are typically found in great rooms, dining areas, foyers and master bedrooms. When found in open kitchens, dens or even home offices and libraries, they often have sliding-glass or french doors incorporated into the window architecture. Custom created window panes and frames are crafted with precision measurements that can take on a variety of shapes, sizes and unique curves. In addition to the plethora of textiles available on the market, you may find yourself with a selection of drapery options for which to hang your curtains in a multitude of styles. With our Free Quote service, your Cadillac Window Fashions Design Consultant will come to your home to discuss the variety of treatment options available that best suits the look, feel and functionality you are seeking to achieve. Should you select to utilize drapery fabrics to adorn your windows you will be met with a variety of hanging and drawing options that our design experts can introduce you to and some you may never even have thought possible. You can easily incorporate textiles to windows you currently have covered with blinds to add a level of sophistication that really elevates your decor. Upon inspecting the windows you wish to have covered we will measure them to specific detail ensuring exact installation for the most satisfying visual appeal. 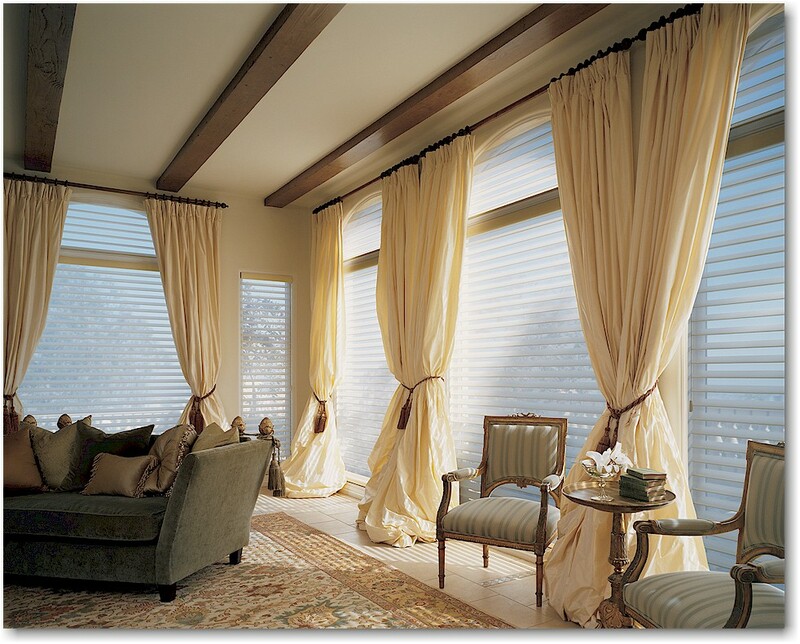 Your drapes will be custom designed and installed to meet your design requirements, whether they be functional to close and elegantly drawn open or stationary to beautifully frame windows that may or may not include additional treatments such as shutters or blinds. We’ve been successfully beautifying home and business spaces in Toronto and around the GTA for well over 30 years now and our forte is our customer satisfaction in the service excellence and high quality product we provide. If you’re the type of person who seeks fresh new creative ways of decorating your space, curtains and drapes can be a satisfying option as you will most likely achieve an aesthetic rarely seen in most homes. Depending on the fabrics and hanging styles used, you can go for a specific vibe like Mediterranean chic, Victorian era, Asian flare, Russian opulence, the list goes on and on, including coming up with your own unique style all its’ own. When combining a style goal with the creative talent of our design experts’ experience and knowledge of the world of options available to you, the result can only be visual excellence. There is a chance that working with us during this process will be so enjoyable for you it may just feel more like creative play than a task at hand. We don’t just stop at windows; in fact we have the talent and ability to go the distance in designing and installing drapery that surrounds a room, as in the case of a home theatre. Customers seeking to line an entire wall, or several walls, with ceiling to floor curtains that block out light from windows and doors and cover walls to achieve a consistent congruency throughout a space. Drapes can also be affectively used in music rooms for sound quality particularly suitable for recording and performing. Even if you’re interested in creating a performance stage in a children’s play room, we can accommodate you with the customized drapery required to achieve theatre stage authenticity you desire. Regardless of your need for curtains and drapes, at Cadillac Window Fashions we have what it takes to accommodate your desires and enhance your decor with excellence. If your space is in or around Toronto, Vaughan, Oakville, Markham, Richmond Hill and more, consider having one of our Design Consultants come out to visit you, discuss your treatment options, your goals and provide you with a free estimate. You’re welcome to visit us online, on Facebook and even in our large showroom conveniently located in Woodbridge. We look forward to working with you to achieve the visual greatness your home and you deserve. We settle for nothing but our best work to ensure customer satisfaction on every order.